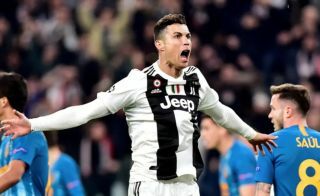 Juventus ace Cristiano Ronaldo has escaped a Champions League ban from UEFA following his gesture in the win over Atletico Madrid earlier this month. As seen in the video below, the 34-year-old mimicked Diego Simeone’s celebration from the first leg of their Champions League last-16 tie. However, it had been suggested that he had directed it towards the travelling Atleti fans, and so that left him at risk of being suspended for the quarter-finals where the reigning Serie A champions face Ajax. Fortunately for both Ronaldo and Juve, he has escaped a ban as noted in the tweet below from Sky Sport Italia, who confirm that UEFA have given him a €20,000 fine but no suspension. That follows a similar decision which was reached on Simeone, and so it appears as though they have shown consistency in their disciplinary action. Ronaldo was in inspirational form in the second leg in Turin, scoring a hat-trick to turn the tie on its head and ensure that Juve’s Champions League dream remains alive this season. He’ll now hope to continue to lead their charge against Ajax, but he’ll perhaps be well advised to tone down his celebrations in future in order to avoid the risk of a suspension entirely. Ronaldo has bagged 24 goals and 12 assists in 36 games so far this season, showing that he’s still more than capable of being Juve’s talisman in their bid to win more major honours.